Bill 5, known as the ‘Better Local Government Act’, introduced in late July, aimed to cut the size of Toronto city council in half from 47 to 25 seats. The premier’s sudden move was a shock not only to Torontonians but city officials who had to change the rules of the election campaigns. Premier Doug Ford threatened to use Section 33 of the Canadian Charter, known as the notwithstanding clause, to overrule the court’s ruling on Bill 5. Section 33, a rarely used section of the charter, is only used to override a court ruling on constitutional rights. Though, his use has been struck down, the elections will proceed with the proposed 25 ward model. Opposition criticized the move as one being abrupt and not being outlined in Ford’s election platform. Protestors were arrested on a September 10th legislature meeting, sparking an outcry from Opposition, questioning Ford’s definition of ‘democracy’. NDP Leader, Andrea Horwath was especially critical, accusing Ford of ‘targeting Toronto’. “All this time to get back at, to get revenge on NDP city councilors that he didn’t like — that’s not what a Premier is supposed to do. And then to use this heavy hand, to use the notwithstanding clause to attack people’s Charter-protected rights?” says Horwath in a media conference. What does Ford’s implementation of Bill 5 mean for the upcoming October 22nd election? Because the size of Toronto City Council is being cut in half, the city’s wards are reduced from 47 to 25, making the councillor-to-resident ratio much bigger. One city councillor would be representing 120,000 residents in a riding compared to 70,000–95,000 residents. 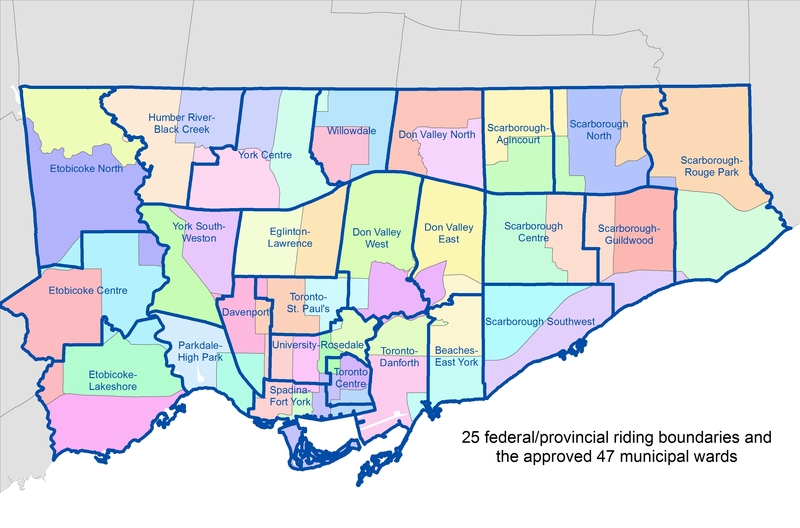 The ridings include Etobicoke North, Etobicoke Centre, Etobicoke-Lakeshore, Parkdale-High Park, York-South Weston, York Centre, Humber River-Black Creek, Eglinton-Lawrence, Davenport, Spadina-Fort York, University-Rosedale, Toronto-St. Paul’s, Toronto Centre, Toronto-Danforth, Don Valley West, Don Valley East, Don Valley North, Willowdale, Beaches-East York, Scarborough Southwest, Scarborough Centre, Scarborough-Agincourt, Scarborough North, Scarborough-Guildwood, and Scarborough-Rouge Park. As a result of the changes to the City Council wards, Toronto Catholic and Toronto District school boards had to change their wards as well to coincide with the new model. Saving taxpayer dollars was a major argument presented by the PC government in support of Bill 5. By cutting the size of Toronto City Council, taxpayers can save nearly $7 million a year. However, critics have judged Ford’s basis of saving money at the cost of jeopardizing local democracy. Mike Harris, who served as the Premier of Ontario in the mid ‘90s, pulled a similar tactic as Ford, cutting the size of elected Ontario officials and did save the province some money. Advance polling begins on October 10th and runs until October 14th.